What’s there: My earlier post, Colourful Kini Bay on Syros island, was essentially a photo tour of the beautiful beach village area where we have stayed during two holidays on Syros. In this companion piece, I have compiled a mini-guide to Kini, highlighting accommodation and dining options as well as attractions and things to see and do in the immediate vicinity, based primarily upon personal experience. I actually started preparing this article several years ago, following our second trip to Syros, but I never managed to finish the project. 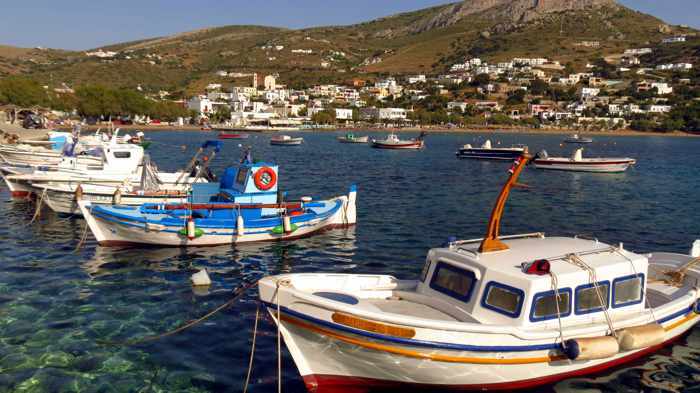 It languished in a folder of draft articles until this winter, when a Travel + Leisure magazine profile of Syros caught my attention and reminded me of the post I had never completed. 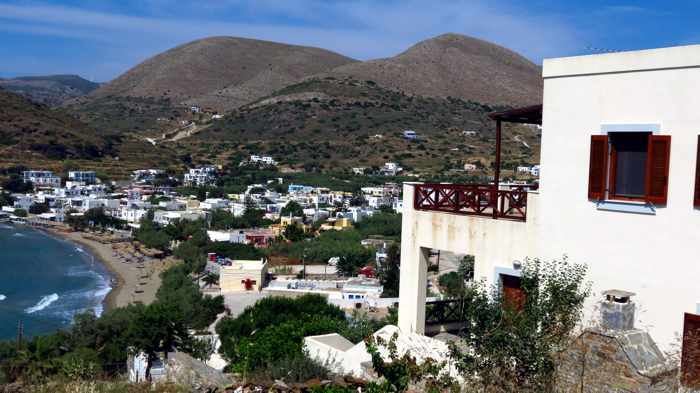 Comments and inquiries about Syros from readers of my blog gave me further impetus to have another go at writing the guide. Besides, it presented an opportunity to see what, if anything, may have changed and keep us up to date on what’s happening in Kini, since we do plan to go back. I also noticed several hotels and studio rental properties have undertaken significant upgrades in the past two years, while others have been renovating this winter in preparation for the 2019 season. The good news for travellers is more (and improved) choices for lodging, along with additional places to drink and dine. Happily, the changes have been for the better, and haven’t had a negative impact on Kini’s comfortable atmosphere and charm. 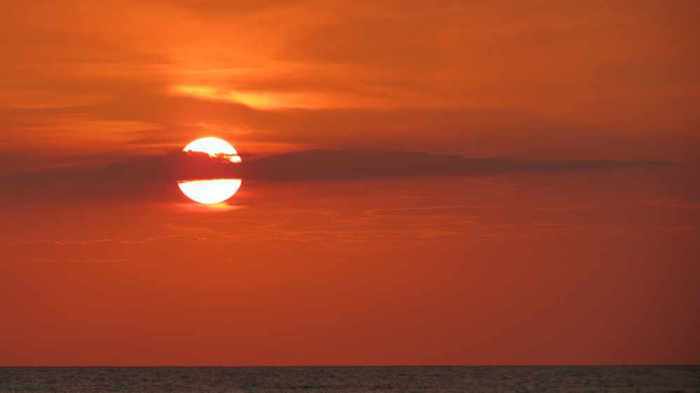 We have seen many remarkable sunsets from Kini (this one was from our holiday in 2015), with vivid sky colours that were more stunning than any we’ve seen on Santorini, the island that’s famous for sunset views. The low-key, laid-back ambiance is what we personally enjoy about Kini, along with its scenic location, marvellous sunset views, sandy beaches, interesting walks and excellent restaurants. 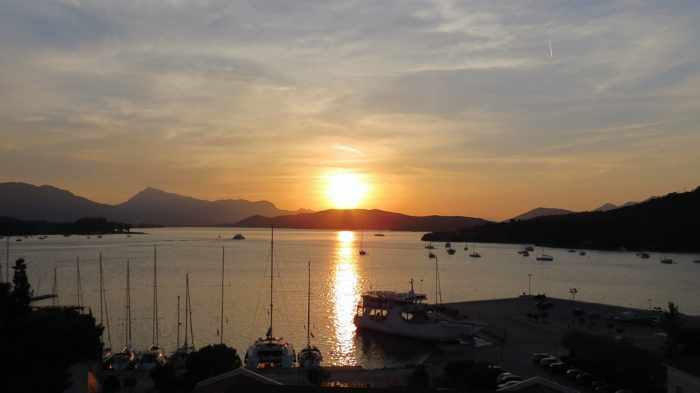 (Its close proximity to the island’s vibrant capital, Ermoupoli, is another appealing feature.) On both of our visits, Kini won our hearts as one of the most chill and relaxing places we’ve stayed anywhere in Greece. In fact, we often muse about going there for an extended period — a couple of months in spring or fall, for instance — since we find it particularly inspiring for our creative pursuits of writing, painting and photography. I know others share our appreciation for Kini just as strongly; online, I have chatted with a number of people who have made repeat visits and are planning to return this year because they love Kini for the same reasons. And when we have spoken to other tourists while we have been in Kini, everyone has commented about how much they were enjoying the place. We never heard anything negative. Kini might not be your cup of tea if your ideal island getaway is a crowded and glitzy tourist magnet, like Mykonos, where you can spend all your time and money shopping in designer boutiques, dining at gourmet international restaurants, and partying at exclusive nightclubs and trendy beach clubs. 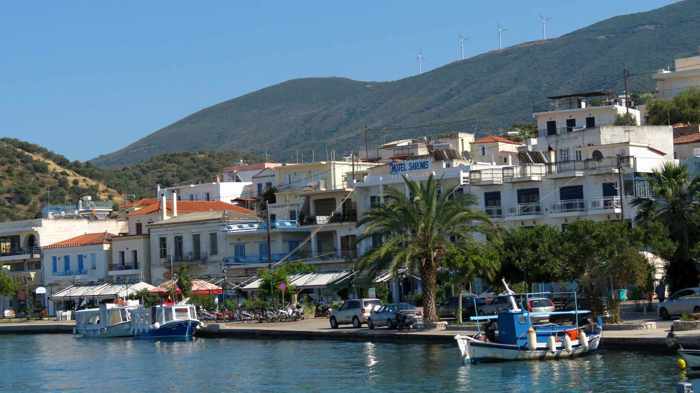 But if your goal is to rest and recharge in a peaceful, picturesque village with good Greek restaurants and nice sandy beaches, Kini could well be paradise. It’s my hope that the photographs, descriptions and personal anecdotes in this guide will give you a solid sense of what Kini has to offer, and will inspire you to consider including Kini in your future holiday plans if it does look like a place you would enjoy. Please click on the links below below to continue reading and see dozens of Kini photos. Page 2 highlights Kini sights, attractions and things to do, with descriptions of local beaches, boat trips to remote beach areas, and scenic walks. Page 3 spotlights places to eat and drink in the village. Page 4 profiles hotels and many of the room and studio accommodations available at Kini. 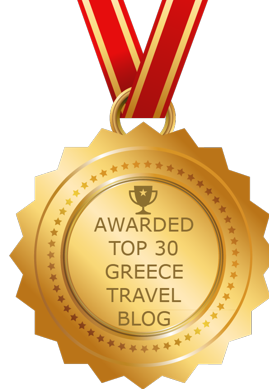 Photo tour: It seems I have stoked some interest in Syros. 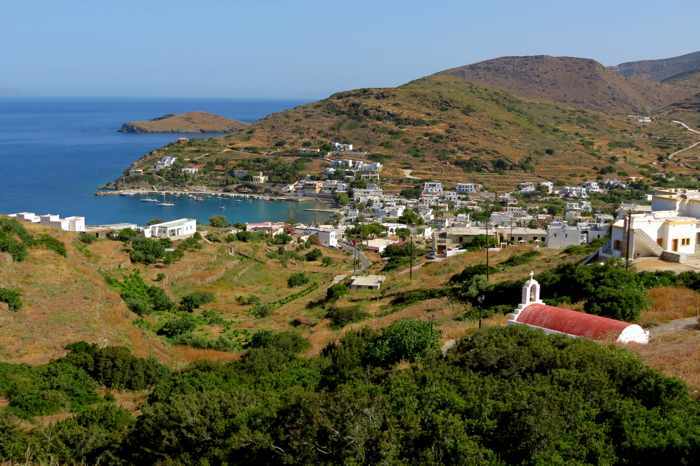 After I posted that Travel + Leisure magazine had profiled Syros island in its February 2019 issue, a number of readers have been in touch to say they are now thinking about going there for part of their island hopping holidays this summer. 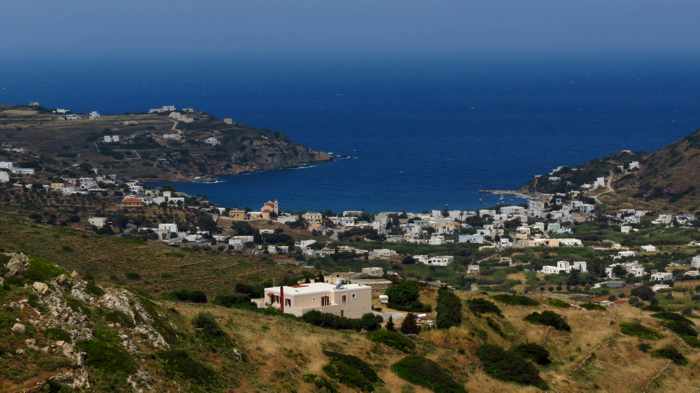 And since I had mentioned that Syros is one of our favourite islands, some asked if I could recommend a specific beach resort area for them to consider. 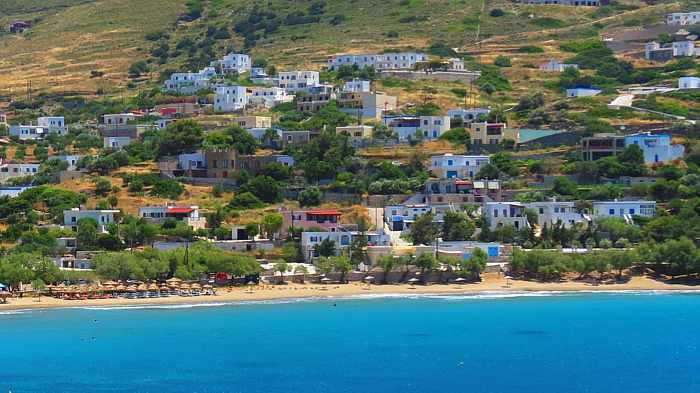 So far we have stayed twice at just one beach location — Kini Bay — and loved it, but we have been to a few other beach areas that are popular with tourists, including Galissas, Finikas and Poseidonia. 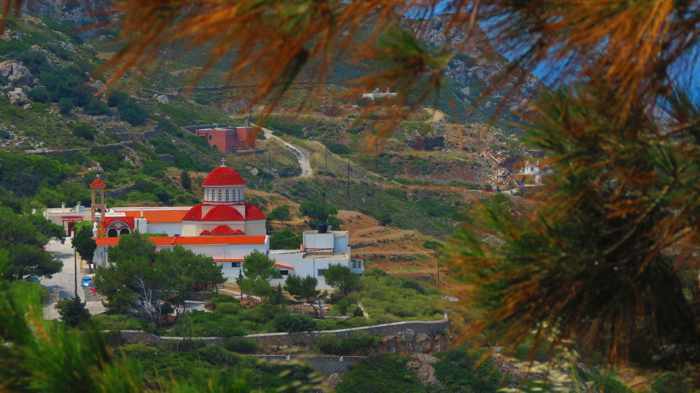 We would probably choose to stay at one of those places on our next trip to Syros, simply for a change of scenery and the chance to to experience a different part of the island. But I wouldn’t describe Kini or any of the others as “resorts” per se; rather, they are fairly small villages situated on or near sandy beaches and scenic coastlines, each offering a respectable selection of accommodations and restaurants. You won’t find strips of shops or nightclubs at any of these locations, but there are mini markets and grocery stores where visitors staying in studio apartments or villas can purchase food and sundry items they might need. 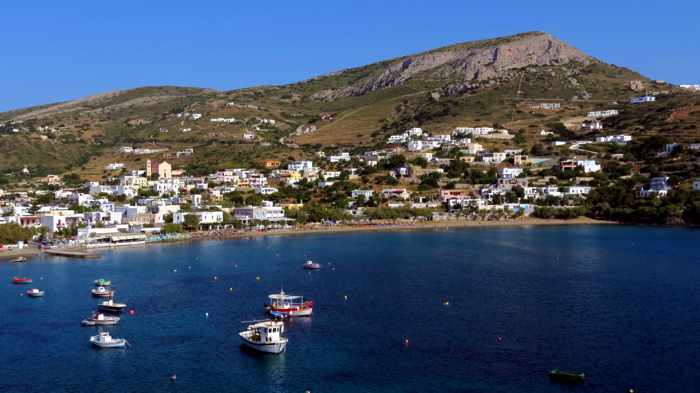 What we particularly enjoy about Kini Bay is its beautiful setting on a picturesque bay, where holidaymakers can relax on two sandy beaches — Kini and Lotos — or at nearby Delfini, which is reasonable walking distance from the village. 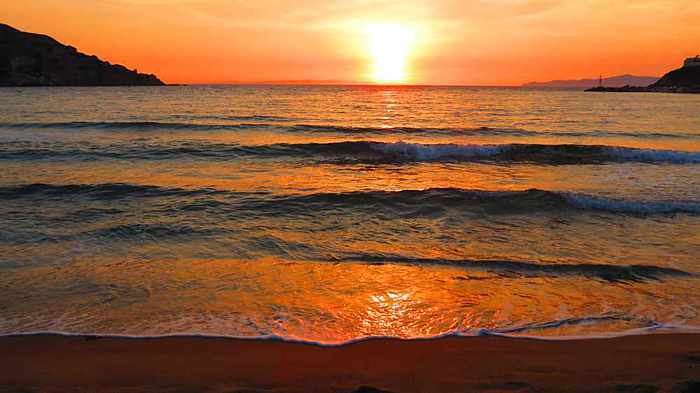 Galissas beach can be reached either by car or on foot (a hiking path that winds up and down hills high above the rugged coast), while boat trips to two isolated beaches north of Kini are offered in season. I’ll tell you more about the area in a separate post I’m currently working on, but in the meantime I have gathered dozens of our pictures to show you why we have been so keen on Kini. Please click on the link below to take a photo tour of colourful sights and scenes at Kini Bay. Postcard pretty: If we had to pick a theme to describe our 2018 spring holiday in Greece, “something old and something new” would suit perfectly. The “something old” was a repeat visit to the historic town of Nafplio, one of our most favourite places in Greece, followed one week later by “something new” — our first-ever trip to Poros, one of the Saronic Gulf islands off the coast of the eastern Peloponnese. Nafplio and Poros proved to be an ideal pairing, not just because we enjoyed both destinations tremendously, but because it was so easy to use local transportation to move from the Peloponnese to the island (as usual, we did not rent a car for our holiday). 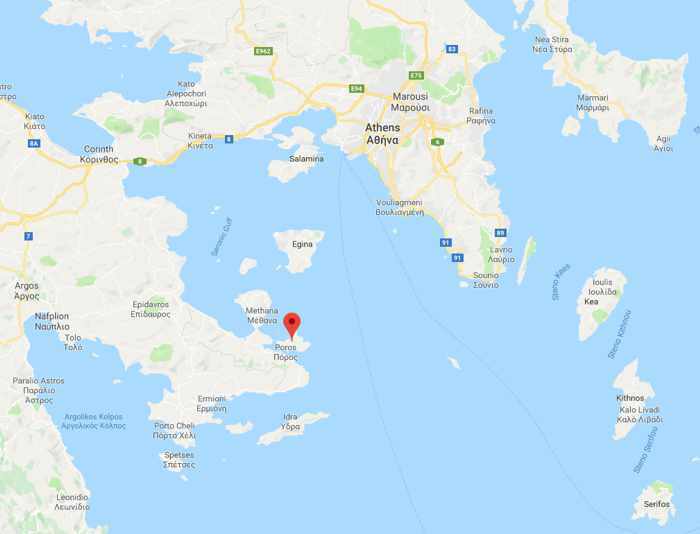 The red marker pinpoints Poros island’s location in the Saronic Gulf archipelago between Athens and the eastern Peloponnese. 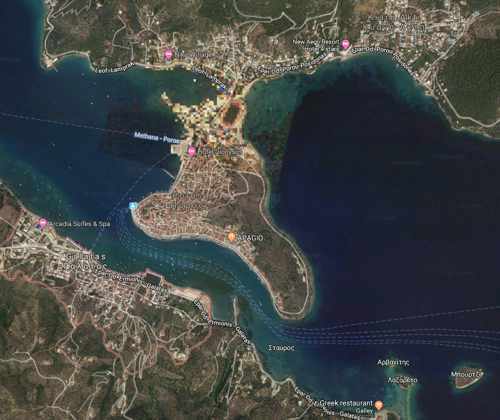 We reached Poros by taking a bus from Nafplio (shown at the center-left side of the map) to Galatas, followed by a quick ferry ride from there to the island. 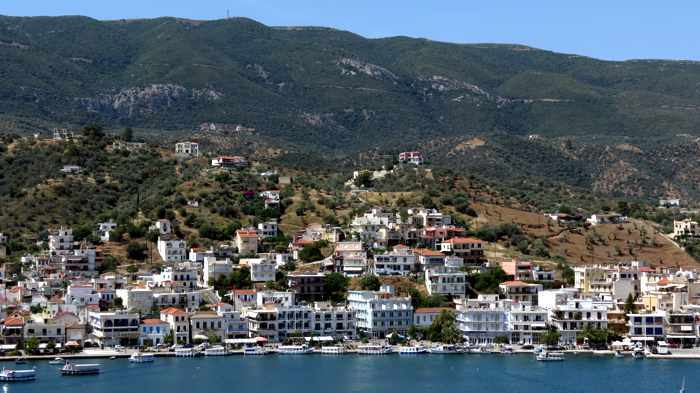 A 250-meter-wide strait separates Galatas, bottom left, from Poros Town and the Sferia peninsula of Poros island. The area at the top of this image is Kalavria, the largest part of the island. Sferia and Kalavria were distinct, individual isles in ancient times, and now are divided by a short, narrow canal. 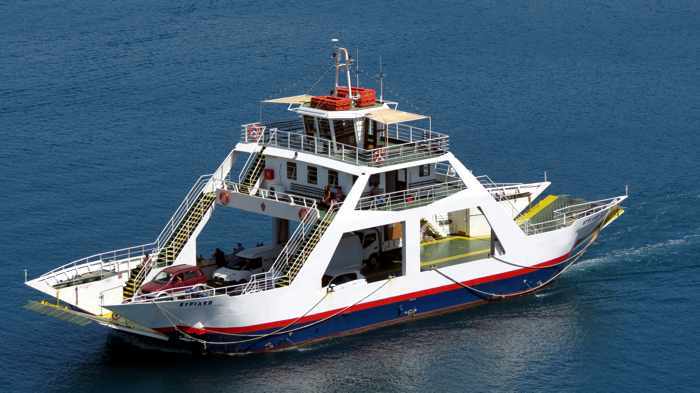 The regional bus system KTEL Argolida operates two daily bus trips (except Sundays) from Nafplio to Galatas, a coastal town separated from Poros by a narrow strait. The 5:30 a.m. departure was far too early for our liking, so we bought tickets for the 2:30 p.m. bus instead (at a cost of just €9 per person). 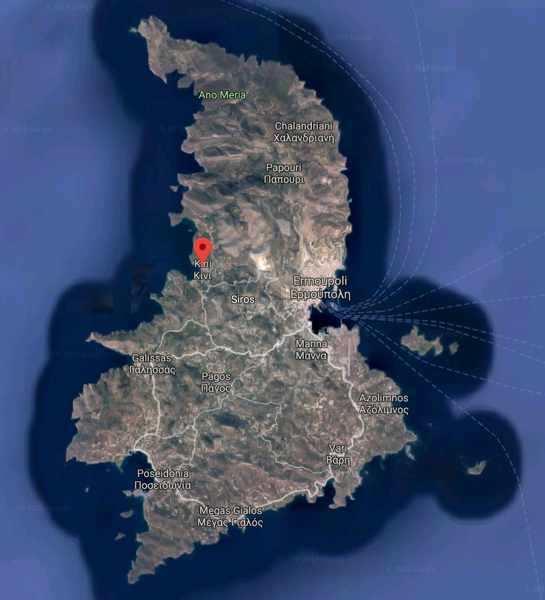 The bus left Nafplio on time, stopping en route at the entrance to the Ancient Theatre of Epidaurus as well as at several villages before arriving at a crossroads where we transferred onto another bus for the remainder of the drive to Galatas. This part of the route was the most interesting and enjoyable, particularly as the road climbed through mountains and then emerged hundreds of meters above the scenic coast. 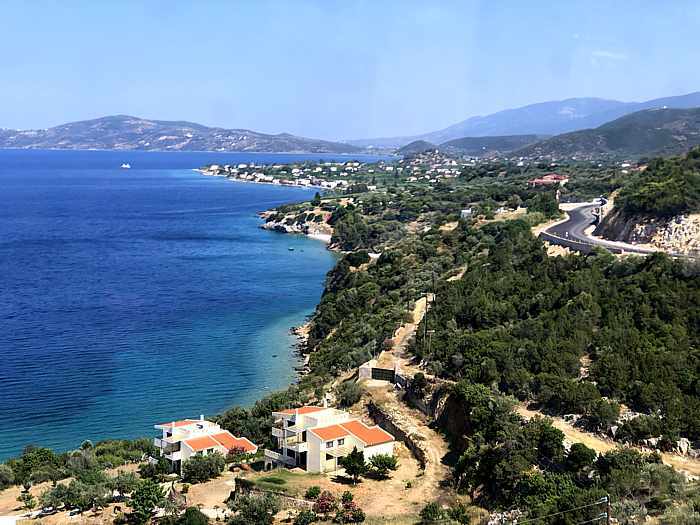 As the bus descended the hillside highway, our seats on the left side of the vehicle gave us terrific views of the Methana peninsula, the Strait of Poros, and eventually Poros island itself. One of the coastal views from our bus trip from Nafplio to Galatas. I shot this photo when our bus was about 10 minutes from Galatas. The bus reached the Galatas harbourfront shortly past 4:30 p.m. , and let us out near the pier from which we could take a ferry to Poros Town, a mere 5-minute or so trip across the narrow Strait of Poros. 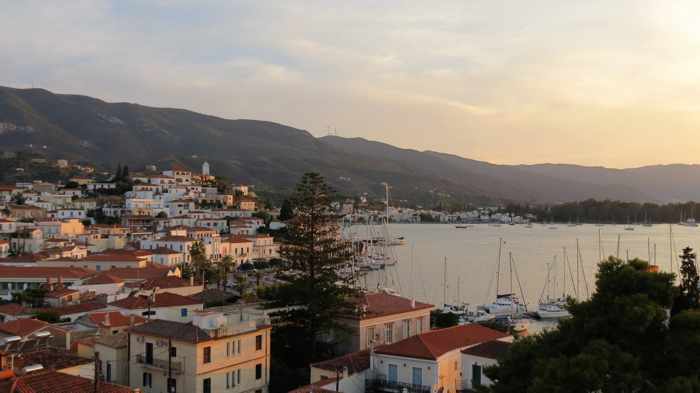 We had time to purchase our ferry tickets (€1 per person one way), admire the excellent views of Poros Town, plus take a peek at some of the tavernas along the Galatas seafront before catching the next boat. The traditional Greek food being served to customers on the patio at Babis Taverna looked so delicious, we were tempted to stay for an early dinner and catch a later ferry to Poros instead (the boats ran every half hour, and water taxis also were available), but we decided to leave dining in Galatas for another time. 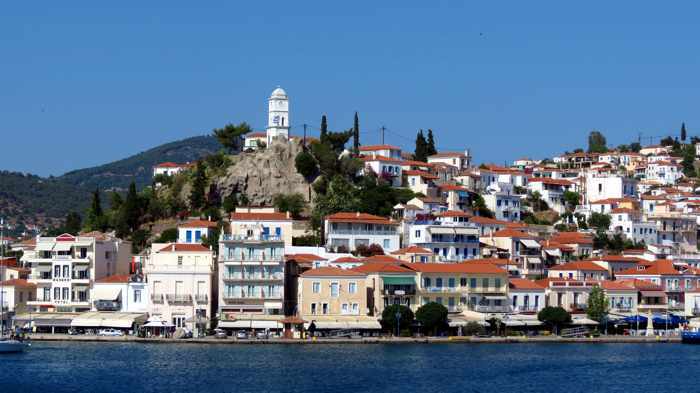 The ferry crossing was as quick as expected, with superb views of Poros Town and its extensive seaside strip lined with shops, restaurants and hotels. 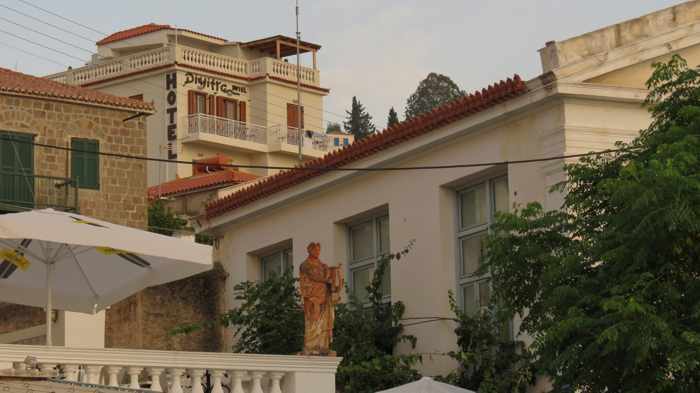 When we disembarked at the Poros Town port, we instantly spotted our accommodations, Dimitra Hotel, on the hillside overlooking the town’s waterfront street. It was just a short walk away, so within minutes we were settling into our room and checking out the great views. From a window and our balcony, we had good views of Poros Town, the edge of the island’s Kalavria region, and the long string of mountains along the Peloponnese coast at the far end of the bay. The extensive panoramic views from the hotel’s large rooftop terrace two floors above us were even more striking, especially at sunset. We could have sat and watched the scenery for awhile, but we were eager to get out and about to explore Poros Town. Since we would be staying at the Dimitra for three nights, we would have loads of time to enjoy the views. Please click the link below to continue reading and to see a random selection of photos from our week-long stay on Poros.